Since the Soviet Union withdrew from Afghanistan in 1989, the country has been subjected to internal military conflict which continues to this day. Human rights in Afghanistan are generally poorly protected and frequently abused, not least those of women. In 2011 an international survey by the Thomson Reuters Foundation concluded that the country was the most dangerous place in the world for women. 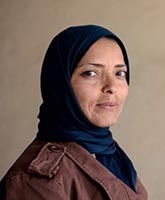 Against this forbidding background, in 2009 Mrs Ahmadi became one of the country’s first female paralegals, after participating in an initiative launched by the anti-poverty charity ActionAid to combat the rising tide of violence against women in Afghanistan. Since then, she has run a shelter in the Bamyan province for women who have suffered violence and abuse. The shelter educates women on their legal rights and provides practical support, counselling and legal advice as well as literacy classes and vocational training. The work Najiba and her colleagues undertake at the shelter comes at a heavy cost. They are exposed to constant threats and Najiba and her family have been subjected to a sustained campaign of intimidation, slurs and death threats which she once described as having become ‘routine’. This led her at one point to send her three young children to live with their grandparents in a different part of the country. Despite all this, Najiba has refused to bow to pressure and continues with her valuable and important work. She has been described as ‘the quiet revolutionary working to end violence against Afghan women’. Nominated by Md Mahbubul Alam, CPE student and chosen for the Inspired by Law gallery of lawyers and legal campaigners in 2015. Photo kindly provided by ActionAid.